I am so happy the weather has finally turned cool. So happy. If we have any more hot days, I just don’t know what I’ll do! Shake my fist at the heavens and curse the weather gods, I suppose. Let’s hope it doesn’t come to that. Since it’s finally autumn and it’s okay to have my oven on for an hour at a time, I made this squash the other night. It was super easy and darn tasty. The salty sweet butter mixed with delicious shallots complements the squash nicely and makes it pretty much impossible to resist. I was inspired by a recipe in a book that I’ll be sharing with you tomorrow…but it’s a surprise. And who knows, maybe we’ll have a few copies to give away. Just maybe. Until then, enjoy some roasted acorn squash with my most favorite member of the onion family, shallots. Cut the acorn squash in half. One half of a squash will feed one person, so do as many squashes as you need. Sprinkle the following ingredients into each squash, in the following order: Shallots (maybe 2 teaspoons or so), 2 pats of butter, a teaspoon or so of brown sugar. 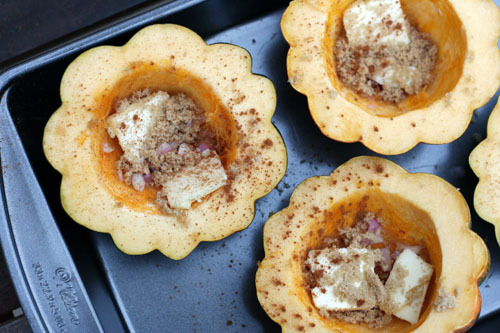 Sprinkle cinnamon over the tops of all the squash. Bake in a 425-degree oven for around 45 minutes (until the squash is easily pierced by a knife). Sprinkle with coarse salt and some pepper. Eat! I roasted butternut squash yesterday. Love this time of year! WIll try this recipe next! I love squash. 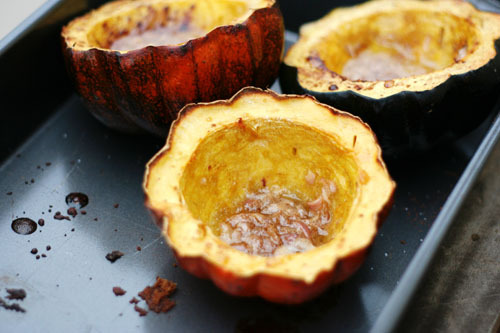 Especially acorn squash, and I will try your recipe as soon as I find some good squash! Looks so yummy! I usually put butter, walnuts, and brown sugar in my acorn squash, so it’ll be good to try something with a twist on that. Mmmmm…. I happen to have two of these babies sitting on my counter right now JaneyMay, so guess what we’re having tonight. Yes, let’s hope the crazy warm weather is done. Adding shallots sounds like a great complement to the squash, I’ll have to try it out! I grew up with my mom making these- my fav fall veggie- it’s what’s for dinner tonight! I just want you to know, we made this for dinner the other night and it was delicious! Seriously delicious. 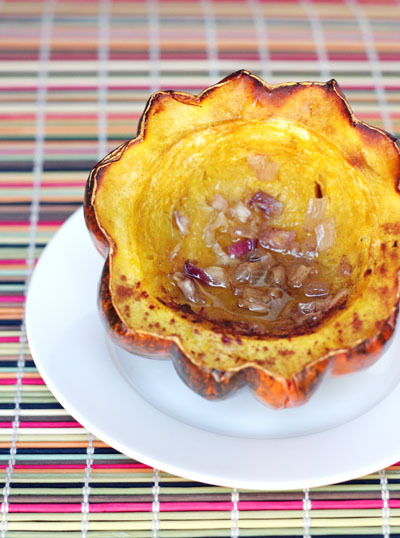 I love the acorn squash recipe! I grew at least 50 acorn squashes in our garden…and have been wondering what to do with all of them!!! Thanks! My oh my this looks delish!! Those look awesome. I guess I’ll be picking some up when I hit the store next! Yum! I made your yummy squash and loved it! The whole house smelled amazing and my mom and Eric both enjoyed it, even though they don’t usually eat squash. Thanks for sharing!